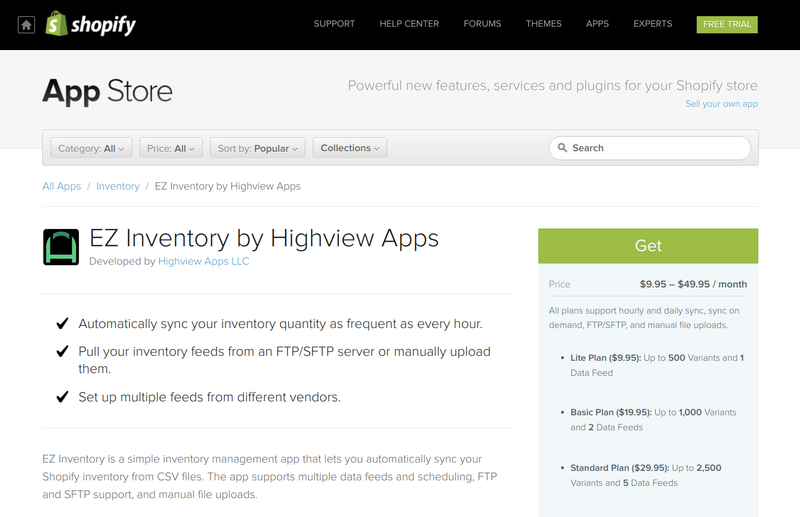 We've been pretty much focusing on building apps on the automation side of managing an e-commerce store and we feel EZ Inventory compliments our two other apps quite well: EZ Exporter and EZ Importer. Both my co-founder and I also have much more experience with backend development so building apps like these makes a lot of sense to us. Proper inventory management is definitely one of those things that could be critical to have a successful e-commerce business. The Shopify App Store even has an entire category dedicated to it. As a store owner, having an up-to-date inventory quantity is really important and could really affect your business. If your inventory is not up to date, you could lose out on sales or end up overselling items that could lead to unhappy customers and support headaches. You could of course hire someone to manually take care of this for you. But if you have hundreds or thousands of SKUs that need updating, this could be costly and error-prone. Automating this process is the ideal solution and this is where EZ Inventory comes in. We've designed EZ Inventory to be strictly for updating the inventory quantity of products/variants in your Shopify store (at least for now, we may add price updates in the future as well depending on demand). Focusing just on the inventory quantity allowed us to keep our app simple, reliable, and easy to use. Create a "Data Feed" and specify the field mappings between your CSV file and Shopify product variants. Run the sync on demand or schedule it to run automatically. As orders are processed, the supplier automatically updates their feeds with the latest inventory data and can be accessed via FTP. The merchant retrieves the latest data feed from the FTP server. The merchant manually updates the inventory quantity for each product variant in Shopify based on this feed. As you can see, doing this for hundreds or thousands of products multiple times per day could be very tedious. And if you have multiple suppliers, then it gets even worse! Our app solves this problem by doing all these steps for you automatically. You can also do a manual file upload of a CSV file containing the latest data to batch update the products/variants in your Shopify store, which still saves you time from having to update them manually in the Shopify admin. We also provide an inventory update history from the last 30 days, so you could see directly within our app all the updates that were made to your inventory. A detailed log where you can see which products were updated at what time (and if there are any errors) is available as well. You can even download the original feed that was used in case you need it. There's of course always something to improve and we'd be continuously making improvements to this app. Below is a quick summary of the available features now and what's currently on our roadmap. Automatically update your inventory from an FTP/SFTP feed every 1 hour, every 2 hours, every 3 hours, or daily at your specified time. View the status of running sync tasks and detailed logs of which items were updated and at what time. You can download a copy of the feed that was used as well. Create a duplicate of an existing Data Feed. URL feed support (both public and authenticated URLs). New plans with higher limits.